This romantic wrap was created by binding Muga Silk with super soft (16 micron) Merino wool top. 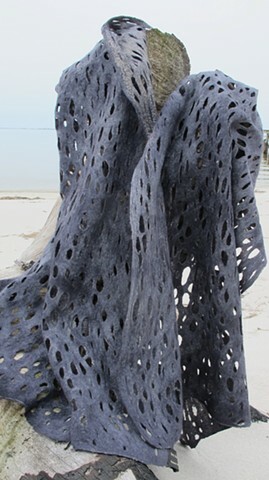 The felt was then manipulated to create holes throughout, then over-dyed in a dramatic charcoal grey for a unique piece of wearable art. This light weight wrap can be worn as a unique scarf or shawl.